SAN JOSE, Calif. (CN) – Silicon Valley’s water district narrowly approved participating in a massive and pricey California water project, including contributing $650 million to help pay for it. The Santa Clara Valley Water District Board voted 4-3 to join the Joint Powers Authority that will oversee the design, construction and financing of Governor Jerry Brown’s approximately $17 million project that will use massive tunnels to siphon water from the Sacramento-San Joaquin River Delta for use in drier regions in Southern California. Estremera and the other three board members were adamant that their votes were not necessarily an endorsement of the Delta Tunnels project, otherwise known as the Water Fix, but stressed that if the project were to move forward Silicon Valley needs to have a seat at the table. The vast majority of public commenters and the three dissenting board members said the board approval of joining the Joint Powers Authority makes another massive and expensive project more likely, which they said means cost overruns, environmental problems and potential liability. Santos expressed concern that by joining the governance board, Santa Clara ratepayers could foot the bill for legal costs if things go wrong during construction – particularly with the numerous gas wells located in the proposed project path. The project, officially known as California WaterFix, looked to be in significant trouble when Santa Clara voted to withhold $650 million in funding last October unless the project was significantly scaled back. But the Metropolitan Water District of Southern California altered the picture dramatically last month when it voted to underwrite nearly $11 billion of the project. The Kern County Water Authority has also voted to fund $1 billion. Santa Clara Valley Water District CEO Norma Camacho said Metro’s vote in particular means the WaterFix is likely coming with or without the support of Santa Clara, so the only remaining decision is whether to participate or let Southern California dictate construction and governance. The project as it currently stands calls for the construction of twin 4-story tunnels running 35 miles underneath the delta, capable of funneling 650 cubic feet of fresh water per second from the Sacramento and San Joaquin rivers south, where households and farms have grown increasingly thirst due to recent bouts of drought. The project is touted by Brown as a long-needed fix to the current infrastructure of the California State Water Project. The state water project, which shares a series of canals, pumping stations and dams with the federally managed Central Valley Project, has long been accused of causing environmental damage due to its reliance on enormous pumping systems that decimate fish populations. 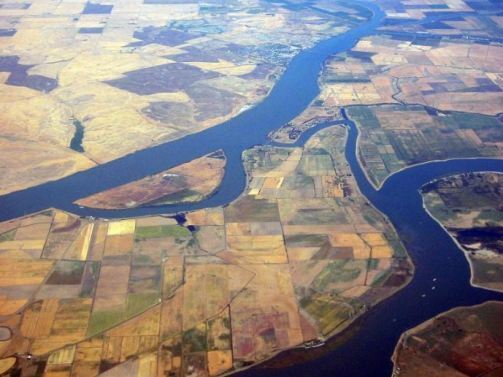 Some scientists say the Delta Tunnels will be more friendly to native fish like Chinook salmon, steelhead and the Delta smelt, which is on the precipice of extinction with dramatically low fish counts in the past couple years, despite wetter winters. But many environmental organizations remain skeptical, saying any large-scale extraction and relocation of water from the north to the south will hurt ecosystems in the delta. “WaterFix is worse than an already poor status quo for endangered fish species and wetlands,” said Earthjustice Attorney Michelle Ghafar. Representatives from the Sierra Club and other environmental organizations also expressed opposition to the project. Supporters of the project told the board the jobs, both temporary and permanent, coupled with reliable water supply offset any concerns. Santa Clara Valley staff noted Silicon Valley gets about 50 percent of its water from the Sacramento-San Joaquin River Delta, and that cutting itself out of the future of water infrastructure in the state could have dire impacts on water reliability on down the road. Barbara Barrigan-Parrilla, executive director of Restore the Delta, said the project is a 20th century solution for 21st century water problems and will end up costing ratepayers more. “When the project inevitably faces increased cost overruns and delays, Santa Clara County ratepayers will be paying more than $10.26 a month, and Los Angeles residents will be paying more than $5 a month,” Barrigan-Parrilla said. A frequent critic of WaterFix, Barrigan Parrilla also hinted the next round to determine the fate of California’s water infrastructure will be played out in the courts. “Litigation is a form of collaboration, and the next chapter of this fight that is far from over,” she said.